Join the discussion on our forums! Come discuss Corpse Raiser over in our dedicated Corpse Raiser discussion topic. He's crazy good in Arena. I'm running a deck now with 2 copies and it's literally won all my games. By far the MVP of the deck. I'd craft him for constructed if he weren't about to rotate. Why is this not considered a top tier card, just because of Spell Breaker? So many really powerful combos with this. The name is a bit misleading because he doesn't really raise a corpse himself. He should be renamed to "He Who Allows You To Raise Your Own Corpse." What's the Corpse Raiser -> Carnivorous Cube interaction? Will Cube keep it's resummon minions on it's own respawn or is the Cube now "empty"? I could test it in Innkeeper, but does anyone know or tried it? 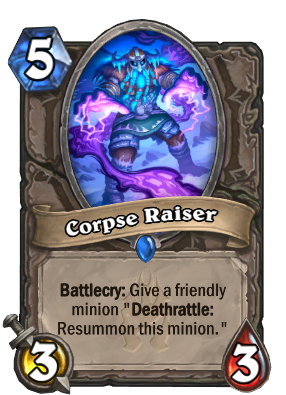 Just tested in Innkeeper.... Actually, the respawn after Corpse Raiser's battelcry is just an empty Carnivorous Cube... a nice thought though, much better to use Faceless Manipulator for so many other reasons. Agreed - in control Shaman, you actually prefer the resurrect because you just want to keep one or two big bodies on the game. Resurrect keeps you safe from AOE. Same reason sludge is great - you kill one taunt and another comes right back. Sticky taunts kill aggro and can deny midrange the openings they need. Because you get a 3/3 body in addition to the extra minion and it's good on wounded minions. It isn't a Faceless Manipulator. This refreshes your minion to full health and gives you a 3/3 body to go along with it. The deathrattle "resummon this minion" can be used as a counter measure to AoE. Faceless Manipulator provides benefits that Corpse Raiser does not bring like copying the buffs and enemy minions but that doesn't mean it is strictly better. How are you supposed to summon 6totems before turn 5? Potion of Madness their Doomsayer in Priest. Or Treachory your own Doomsayer in Warlock. Not a value play, but a funny corner combo when they don't see it coming. They already were OP in Un'goro. Spellbreaker was a good tech card in constructed and Tier 1 in Arena. Silence is and will always be OP. You know Silence is OP when Blizzard only has 1 playable neutral cards with SIlence effect. How does this interact with n'zoth? If not used on a minion that already has deathrattle, does it bring that minion back when you play n'zoth? I don't understand the down votes for this comment; he's not wrong. If a Deathrattle minion gets resummoned, it will presumably die a second time, which gives the opportunity to get another two when N'zoth is summoned. It does have interaction with N'zoth, just not in the way the question was asked. 3 mana 3/3 that casts Ancestral Spirit. Except it can be used in any class. Definitely a playable card, but doubt it will be used in constructed. Arena however will likely love this card.